Passive Income | Ideas | Recurring | Multiple | Automated | Yenom Marketing Inc. Passive Income consists of recurring, automated, multiple streams of income. 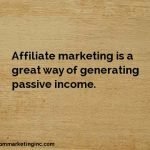 What is passive income? Why do you need it? Discover many passive income ideas.